You walk into a large chain grocery store and see a bin of bright, lip-smacking oranges across from the entry. You race over, thinking of all the delicious recipes you can make using these pristine fruits: orange glazed salmon (link to recipe), warm spiced wassail, fresh slices for your child’s lunch. You get to the bin, but the oranges don’t look the same as they did from the entryway. Half of the oranges are still green, not quite ripe yet. The other half are brilliant orange, but they’re small, with a thin skin that tells you they’ll be more bitter than sweet once peeled. This is what you get with big chain grocery stores. Your produce is picked too early so it can be transported by train, plane, or truck from city to city before finding its way onto the shelf. Your meat is slapped onto ice in hopes it stays fresh as it travels across state lines. Food quality is one big reason why many people have made the switch to shopping locally, but it’s not the only reason. If you’re on the fence about your grocery store, find out here why local markets stretch your dollar a whole lot further. A study by the University of California found that vegetables can lose 15 to 55 percent of their vitamin C within a week of being plucked. Some spinach can lose 90 percent within the first 24 hours! In fact, the study concluded that most produce loses 30 percent of its nutrients three days after harvest. That doesn’t give your produce a lot of leeway when it comes to travel time. Even so, big chain stores truck their produce and meats in from Alaska, California, Florida, and even as far as Chile or Holland. Studies have shown that the average distance food travels is 1,500 miles in a week-long trek before it gets to your dinner table. During that time, sugars turn to starches, plant cells shrink, and produce loses its vitality. That’s why those oranges from a big chain store were more than disappointing. Local stores, on the other hand, often source their food from local farmers, which means you can sometimes get produce from the farm to your table in under 24 hours. Fresher produce means better taste and more healthy nutrients—and that’s what you get when you shop locally. In 2012, a civic economics study in Salt Lake City compared the economic impact local businesses had on the city compared to chain stores such as Target, McDonald’s, and P.F. Chang’s. The survey found that local restaurants contributed 78.6 percent to the local recirculation of revenue, with 42.9 percent coming from profit and labor. Big chain restaurants, on the other hand, only contributed 30.4 percent to the local recirculation of revenue total. Less than what local restaurants gave back in labor alone. Big chain stores have also been known for their less than livable wages and displacement of local workers. One store argued against paying a living wage in Washington D.C., and threatened to leave the area when legislation passed requiring them to pay employees $12.50 an hour, a hardly livable wage in regards to the city’s standard of living. Stories like that remind us that shopping locally is not only important for job growth in our communities, but to maintain the integrity of those communities. When your neighbor is your store clerk, you get the best customer service possible. So when you shop locally, you not only support your local economy, but you improve your own shopping experience. The civic economics study had more interesting findings. While big box retailers only contributed 13.6 percent to the local recirculation of revenue, local retailers invested 52 percent, with 3.1 percent being charitable giving. Local businesses return over half of their revenue to the community in the form of jobs, local spending, and charitable giving. Big chain stores don’t even give back one third of their revenue to the community that made them money in the first place. If you’ve ever shopped at a local grocery store, you don’t need facts and figures to tell you why it’s the best choice. You know because of the experience you have there. The fresh produce and meats come straight from trusted local sources. The staff is friendly and always willing to lend a hand. And you know your dollar is going further because you’re re-investing in your community. 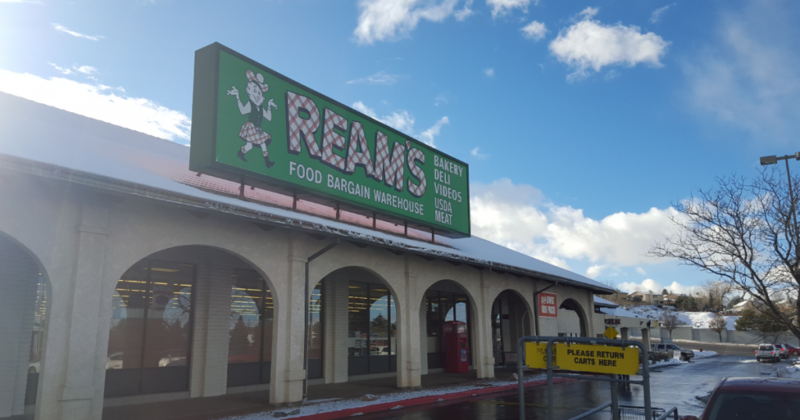 For a taste of the true local shopping experience, stop by a Reams near you today and see the difference for yourself.